Aksharadhool: Let the bugs handle it! Let the bugs handle it! In any city, a lake or even ponds of smaller size are always the center of attraction. Ahmadabad has its own Kankaria lake. Chandigarh has Sukhna lake. In fact Chandigarh's creator Le Corbusier, when he designed this city, wanted to build a city integrated with a water body or a lake. Some cities are much more luckier. They have several of these water bodies and that too, which were created naturally much before the city came into being in that place. Famous garden city of Bengaluru in south India is one such city, which has several lakes and ponds within the city limits itself. During late 1060's, when I studied in that lovely city, I still remember some fabulous excursions made by myself along with my class friends around the the city. One of my favourite places was the Ulsoor lake. Located on the eastern side of the city, it is spread over 50 Ha and has number of small islands within. I remember vividly, how we used to rent a small boat from a club on the shore and puddle to one of these small islands to spend a lazy Sunday afternoon chatting with friends. Even the famous Cubbon Park of Bengaluru, right in the middle of the city, has a beautiful lotus pond. During last two decades, as Bengaluru grew by leaps and bounds, the famed natural air conditioning of the city, it's environment, weather, rain fall pattern, almost everything has changed for the worst. Gone were the days of a city, where mornings could be spent in the Coffee house on MG road, animatedly discussing some issue or other and lazying around some garden in the afternoons. Bengaluru became a modern metropolis with inherent crowds, dirt and sleaziness. This change for the worst naturally also affected Bengaluru's famed lakes and ponds. These water bodies started dying when decomposing dead matter started adding up in the waters along with pollutants, dust and grime and even solid waste matter. The health authorities then started pumping large amounts of DDT (dichlorodiphenyltrichloroethane) onto the water bodies, which effectively got transferred into the ecosystem. The water quality of most of the lakes thus became dangerous for fish and all such aquatic living beings. Fortunately for the city, the State Horticulture Department hit upon an idea to restore the water bodies with microbial treatment, in collaboration with a private firm, sometime in 2009. The Ulsoor lake was tried first that year. The methodology is called ' The effective microbe (EM) technology ' and consists of spraying the water bodies with several breeds of live microbes, including yeast and photosynthetic bacteria, that react with the decomposing or dead matter and break it down. The effect becomes apparent within 2 or 3 weeks, when the stinky odour emitted near the water bodies starts reducing. emitted by the substance. The technology can even break down solid waste. 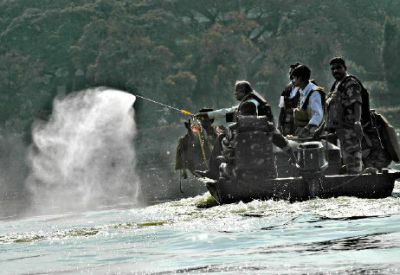 The stench-filled water of the Ulsoor lake became deodorised with the first trial using 1,500 litres of the solution on November 28, 2009. Twenty days later, the slime disappeared with the second operation, using 3,000 litres of the microbe solution. The activated microbes, when poured into the water, eat into the black sludge which clogs the walls of drains and mosquito larvae, thus solving two problems in one shot. After seven weeks of treatment, biodegradable waste converts to organic manure which can be used by farmers The Ulsoor lake would need several more phases of EM solution treatment before the lake can be declared pollution free. The private firm was then asked to clean up Anjanapura junkyard as an example. The firm's spokesman says proudly that “We cleaned up the smell there in 45 minutes.” Encouraged by the results so far, State Horticulture Department, again with the help of the same private firm, launched a project recently to clean up the lotus pond in Cubbon Park. The water from this pond eventually flows to Bal Bhavan in the park and is also used for gardening outside the park. The results are expected in next 2 or 3 weeks. After this period, smaller increments of 'Effective Microbe' technology dosages would have to be given to maintain the results. According to the firm's spokesperson, this EM technology was developed by the Japanese and has been successfully put to use in New Delhi and Tamil Nadu among other places to treat the waste water and solid waste. It is also quite economic to use this solution. 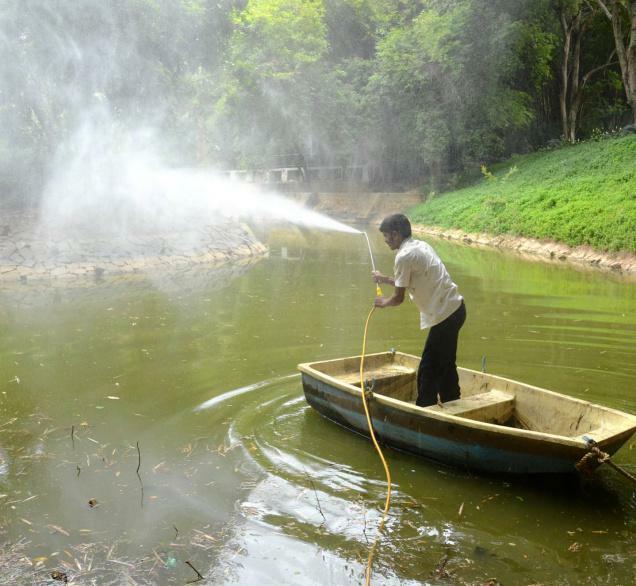 The Cubbon park lotus pond would need about 25 to 50 liters of the dosage with average cost of just Rupees 50 per liter. In India most of the city lakes and ponds are facing similar problems. It may be worth while investigating this microbe approach and make the bugs work to clean up the water bodies.